Is everyone ready for Thanksgiving tomorrow? I’m doing some of the prep for my dishes today and working on setting our table, so that I can really enjoy tomorrow. Thankfully, my mom is in charge of the turkey and the more complicated stuff, and we’re looking forward to a nice and laid back day and dinner. I won’t be posting tomorrow, because I’ll be spending the holiday with my family (and probably going to bed at 8:00 after a big dinner). But tune in first thing on Friday morning for a round up of the best in Black Friday sales! If you missed it, don’t forget to check out last week’s gift guide and enter the giveaway, which ends today! Onto this week’s guide! 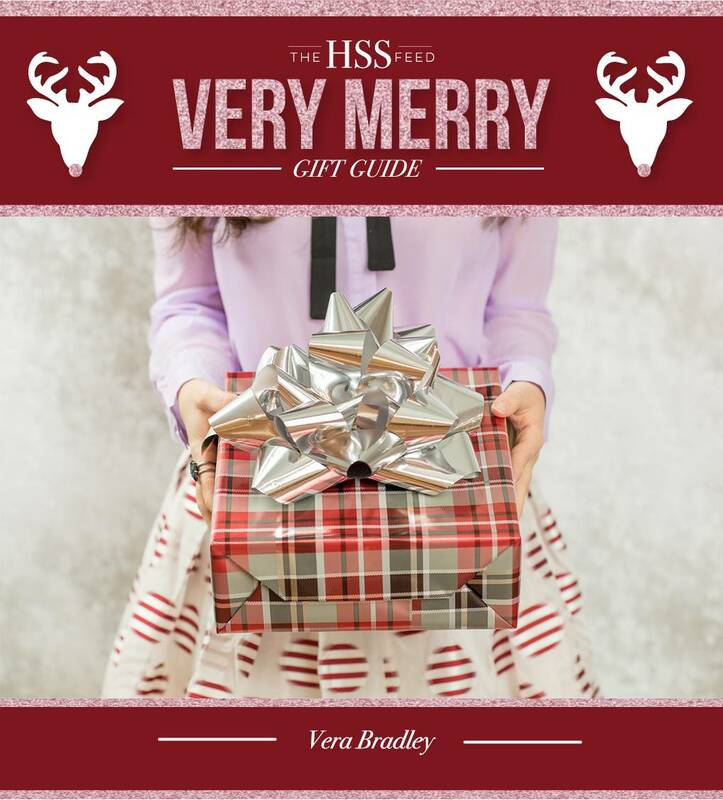 I’ve really enjoyed working with Vera Bradley this year and I am excited to round up a few of my current favorite styles that would make great gifts. This jewelry organizer (last seen in this post) is an absolute must-have travel accessory! Vera Bradley makes the coziest throw blankets you’ll ever find! They come in the cutest prints and make a great gift, especially when combined with a cute pair of PJ pants or a wrap. This RFID wallet, in a pretty plaid print, provides protection for your credit and debit cards and is a great gift for any of the ladies on your list. Looking for a splurge? This quilted leather duffle is a great weekender bag and I love it in red – just a little something different than your basic black luggage! We should probably keep those giveaways going, right? Thanks to Vera Bradley, I’m going to do exactly that. The Vera Bradley throws are one of my very favorite things, and I want one of you to have one of them, along with a cozy hooded fleece robe. They’d make great gifts for someone else, or for yourself, to cuddle up in as you enjoy the holidays at home. Enter on the widget below by Wednesday, November 30 at 11:59 PM and the winner will be announced by Friday, December 2. I love Vera Bradley so much ! You picked such awesome items from them! I want it all! These are such great gift ideas! I’d love that throw! Such great gift ideas. Vera Bradley has had my absolute favorite collection this year! I love all of these! I especially need that jewelry organizer! Happy Thanksgiving! I would looooove that quilted leather duffle bag! I love Vera Bradley, the patterns are always so amazing! Those gloves are my favorite, so cool! I love that throw blanket! Love the quilted duffle bag!!! The Throw Blanket and the Ultimate Jewelry Organizer are on the top of my list! Love them! I would like to receive the gloves. I really need to get myself a travel bag for my jewelry! I love #1! I would love to receive the jewelry organizer. I love all of your picks!! Great print too! The bright ideas notepad is SUPER CUTE! that hoodie is so cozy looking! what cute pieces for this season!! I would love to receive the quilted duffel bag. i would love the fleece! I’d love a new duffel! the makeup carrier looks so cool! the hoodie looks so fantastic!